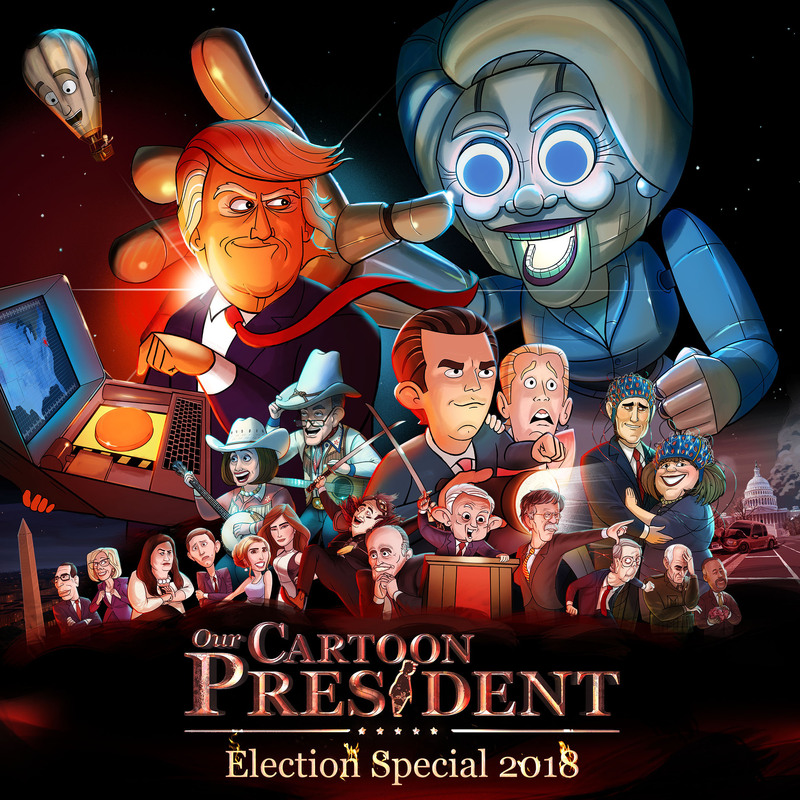 LOS ANGELES – October 31, 2018 – Just ahead of one of the most consequential midterm elections of our time, the SHOWTIME animated series OUR CARTOON PRESIDENT takes a look at the political field in an expanded election special on Sunday, November 4 at 10:30 p.m. ET/PT on SHOWTIME. OUR CARTOON PRESIDENT: ELECTION SPECIAL 2018 focuses on Cartoon Trump’s deepening concerns about what he fears is a coming Democratic “Blue Wave” and his possible impeachment. Cartoon Trump teams up with his son Cartoon Don Jr. to try to help Republicans win the midterm election and save America from the grips of democracy. Joining in the fight are cartoon versions of Vladimir Putin, Ted Cruz, Bill and Hillary Clinton, and Barack Obama. Executive produced by multiple Emmy®-winner Stephen Colbert, Chris Licht and showrunner R.J. Fried, OUR CARTOON PRESIDENT follows the tru-ish misadventures of the 45th President of the United States, Donald J. Trump, and his merry band of advisors and family members. OUR CARTOON PRESIDENT is produced by CBS Television Studios. Tim Luecke serves as lead animator and co-executive producer. Matt Lappin serves as consulting producer. To learn more about OUR CARTOON PRESIDENT, follow @CartoonPres on Twitter and Facebook and join the conversation using #CartoonPresident.